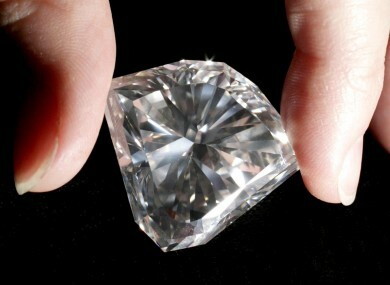 A diamond, thankfully not lodged in a thief's gullet. A CHINESE MAN arrested for attempted theft after swallowing a diamond worth about €11,000 at a gem exhibition in Sri Lanka will have to undergo surgery to remove the stone, police said. The 32-year-old had asked the stall owner for a close inspection of the 1.5-carat diamond on the opening day of Facets Sri Lanka, an annual jewellery show in the capital Colombo. “He came with another Chinese man. One of them tried to distract me while the other had a diamond in his hand,” Suresh de Silva, director of the Belgrade International gem store, told AFP. The man was taken to the Colombo National Hospital where he was to be administered laxatives, but police said X-rays showed the diamond was lodged in his gullet and was not going down. “Doctors have advised surgery to remove the diamond,” police spokesman Ajith Rohana said. He said a successful prosecution was dependent on retrieving the stone, adding that officers were also keen to interview the other man, who fled the hall. The two men had arrived in Sri Lanka on Monday as tourists, police said. The diamond owner Silva said the captured man had offered to pay for the 7.2mm-diameter stone, which was valued at 1.8 million Sri Lankan rupees (€10,800), but that exhibition organisers wanted police to press charges. “He… appeared to be appraising it and suddenly put it in his mouth,” a police officer who declined to be named said. A spokeswoman at the hospital said that an X-ray had been taken and that officers were holding the suspect under observation. “I believe the X-ray confirmed something that looked like a stone. The man is in police custody,” National Hospital spokeswoman Pushpa Soya told AFP. Photographs showed the man, dressed in a black shirt and jeans with his head bowed, being escorted from the exhibition centre by uniformed policemen. Sri Lanka does not mine diamonds but it has a large gem and jewellery industry and is famed for its blue sapphires. Email “Thief to undergo surgery after swallowing €11k diamond”. Feedback on “Thief to undergo surgery after swallowing €11k diamond”.